If the shoe fits: Preventive shoeing for different equestrian disciplines. Although enormous differences exist between different equestrian disciplines, different horse breeds used in these, the ground surfaces they perform on and shoeing materials and styles, it should not be forgotten, that all horses have basic anatomy and physiology in common and that sound shoeing principles can be applied, no matter the breed or the discipline. 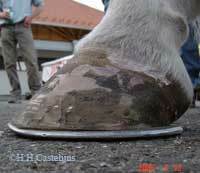 Shoeing is a necessary “evil”, for those horses, where hoof wear and tear dominate over hoof growth. Shoeing might be necessary for grip in some conditions. Trimming should establish hoof shape and length, adapted to the limb the hoof is attached to. The shoe should be shaped to the foot and not the opposite. Nails should ingress on the white line. Shoes diminish elastic movement in the hoof, especially vertical movement at the heels. Shoeing protects the hoof from wear at the toe, but not at the heels. A. Trail, hacking, equestrian tourism. Trimming: respectful of digital axis, latero medial balance and conservative relative to the sole, frog and bars. Shoeing: Generous break over on the front shoes ( rockered toe) , slight rolling or rockering of the hind shoes, which can be slightly set back relative to the hoof, so as to diminish over reach injuries. Nail with 6 nails, leaving, if possible, two free nail holes ( a loose shoe during a long trail ride can then be quickly assured with two new nails in those holes). Leave the lateral and medial frog sulchi free from shoe-heel overhang, so as to prevent stone catching. Materials: This depends in part on the morphology of the horse and its hooves. Quarter creased, clipped ( toe or quarter clips on the fronts, side clips on the hinds). Section width of 20 x 8mm. on smaller hoof sizes ( 3 x 0, 2 x 0); 22 x. 8mm. on medium sizes ( 0,1, 2); 25 x 8mm. in the larger sizes. If wear is excessive to reach a normal, 6 weeks’ shoeing interval , it is advisable to first increase width, before increasing height ( thickness) of the shoe ( e.g. by going from a 22 x 8 to a 25 x 8 mm. shoe, instead of to a 22 x 10mm. one). Anti slip devises should be minimized, as they are usually fixed; shoes with a crease in the toe area ( e.g. continental, eventer, future, etc ), should be attempted for slippery conditions, before choosing widia (hard metal) cones or studs. Show jumpers stress their flexor structures, including the podotroclear apparatus, highly, this is partially compensated for by good arena surfaces. Hind shoes can be well set back, as overreach injuries are quite common, 6 nails per foot, may need more if studs and/or hoof pads are used. Materials: Shoes should have flat , uncreased heels for stud hole drilling. Front shoe stud holes should be placed at the end of the quarter crease, which diminishes the studs’ leaver arm on the digital joints during sharp turns. For section sizes, see the previous chapter. Clips help stabilize the shoes and are more important when pads and studs are used , relieving stress on the nails. Dressage arenas tend to be of good quality. Typical, “professional “, lesions of the dressage horse include suspensory ligament desmitis ( fore and hind) and bone spavin. Speed and therefore shoe weight, is less critical as in some other equestrian disciplines and there are even proponents of increasing shoe weight, to enhance movement and expression. In reality, horses tend to adapt quickly, returning, within days of the shoe change, to their natural gaits. Nailing can be quite light , some horses can train and compete with 4 nails per shoe. Horses with varus hocks, may benefit from a slight lateral extension on their hind shoes, as a preventive measure against spavin. [ fig.7,a,b ] . Dressage horses are among the rare horses which work on ideal surfaces, many of them can be worked barefoot, at least behind. Interpreting hoof balance and shape is important with all horses, but especially so with toed in horses, like many P.R.E. ( andalusians). This conformation easily leads to “winging” ( lateral deviation of the arch of movement of the foot in the air) , which is frowned upon by the judges. placing break over on the outside toe, where the toed-in horse likes to push off. keeping a normal/tight fit of the shoe under the atrophied medial heel, with a slight ground bevel. using light weight shoes ( aluminum ) . Shoe sections are generally rectangular and wide ( no concave here), as this keeps the horse from sinking too much in the deep arena ground. Eventing is hard on the horse and the shoes, as it combines three different disciplines. The fast cross country leg is generally run on grass, which requires anti slip devises ( studs). Most eventers are thorough bred, or T.B. crosses, with rather thin hoof walls. Shoeing should be light, tight , frequent and creased at the toe, but not at the heels, so as to accommodate the stud holes. Many T.B. feet, not only have thin walls, but also rather thin soles, making pads essential. A good pad-packing combination is a Luwex super6 pad - which has six small plastic studs on the ground surface , making it less slippery than normal pads - with lightweight 120S polyurethane packing. With higher speeds, lightness becomes more important. Thin walls require meager nail hole placement and long, thin nails, like for example MX nails (the nails have to hold shoe and pad). Sometimes it is useful to increase shoe stability on the fronts with quarter clips. When trimming, heels should not be left too long or high, as eventing horses frequently suffer from superficial digital flexor tendonitis and suspensory desmitis. Typical shoes for eventing include semi concaves, like the St.Croix eventer and the FIFPE Future model and for more solid hooves the Mustad Continental. Aluminum versions exist of the St. Croix eventer, although it is not easy to find the right compromise between lightness and wear-resistance. The difficulty in shoeing driving horses derives, from the surface they work on, which is often hard, compact and slippery and from the great wear these horses cause to the shoes. The digital axis of the driving horse can be rather upright, which on compact ground conditions calls for a decidedly rockered toe, which not only is easier on the distal joints, but has the added advantage of diminishing wear at the toe. Alternative anti slip shoes exist,e.g. Öllöv, Mustad Nail Shu,Colleoni Alu Gomma . [fig.10]. Wear, during the first shoeing period , with the alternative, rubber or polyurethane covered shoes, can be quite heavy, only to diminish over successive shoeings, as the horse needs time to “ learn” that there is no more initial sliding on ground contact. [fig.11] Once adapted to the new shoe type, shoe wear can become quite reasonable, occasionally even less than with traditional shoes. These alternative shoes are not always easy to shape and apply correctly, but when the alternative is steel with widia cones, they might be worth the effort for the long time comfort (and security) of the horse. Problems encountered in hoof care of endurance horses, are similar to those of shoeing hacking and trail horses, with the added difficulties of speed and very high mileage. Furthermore, most quality endurance horses are arabians, with average- to small hoof sizes and medium hoof wall thickness. Limiting shoeing weight is important to limit energy wastage. So is sole protection against bruises, at least on front feet, as terrain can be quite variable. High mileage means high wear and frequent shoeings, even with most steel shoes, and is often a limiting factor for use of aluminum shoes. A steel concave shoe, with quarter clips ( e .g.Eventer, future ), for round fore feet, with a Luwex pad and home made easy blue padding ( lightweight but resistant), is a typical good working compromise, weighing about 350 gr. and lasting between 300 and 500 kms., depending on ground conditions and individual conformation and gaits. It also offers a decent grip, both on compact ground and grass, while not sinking too much in deep ground (sand). [fig.12] Drilling the nail holes in the pad has been demonstrated to increase its shock absorbing properties Another useful model can be a classic roller, with its half round section, as it reduces wear and tear on the joints on hard, uneven ground. Hind feet, with their more concave soles, usually can be shod without pads. Shoes should be relatively closely fit, as shoe loss during competition can be hard on the hoof and on the competitors’ chances. Too much heel support should also be avoided, as it will increase fetlock extension on some surfaces ( deep ground), the fetlock being the weak point of many high mileage endurance arabians. Shoeing intervals can be quite short ( less than 30 days), due to high wear, nailing high and into solid wall, may allow for reusing the same nail holes in the wall twice, thereby limiting the “ Swiss cheese” effect. Reining is not the only western equine discipline of course, but it is the one with the most specific shoeing demands. .
Fore feet are usually shod with light steel ( e.g. SX 7), or aluminum shoes, blunt toe and with a rather close fit, as setting them wide would interfere with the spinning maneuver. Hinds are shod with sliding plates, uncreased, with a very wide web ( 6 x 28-32 mm.) and plenty of heel- and sometimes even toe, extension. All nail holes are used; often nail holes are made to measure on blinds, and nail heads are filed flush with the ground surface of the shoe. The heels of the hind shoes should not bend towards the frog, so as not to brake in the arena’s dirt; the whole object of the sliding plate being to facilitate the long straight slide of the hind quarters, when performing a sliding stop. A slightly rolled or rockered toe can keep the leading edge of the slider from accumulating dirt in front. This can be particularly useful in young horses, which have difficulty bringing their hind limbs correctly under their body. [fig.13] Both front and hind shoes are usually clipless, sometimes toe or quarter clips ( hand-drawn) can be useful on the sliding plates to keep them in place. Polo fields are usually grass; a chucker (single period during a polo game) basically consists of continuous accelerations, stops and turns, polo ponies are therefore usually shod with medium light concaves, similar to larger section race or steeple chase shoes, in sections of about 19 x 8 mm. Two side clips on hind shoes are recommended. Hind shoes usually have one, single 3/8 inch tap hole on the outside heel, for a single screw-in stud during competition. The single stud allows for easier pivoting of the inside leg, with less stress on the hock and stifle. Preparing the stud hole in concave shoes is better done with a punch, which “ chases” the material away, instead of drilling it out. I. Racing; flat and steeple chasing (fences). Nails are small, thin and are placed low, the nail holes are alternated at the next shoeing. Thoroughbreds tend to have thin walled, thin soled, round, elastic feet, ideal for speed. The low heels and very close fit, with beveled, “ pencil” type, heels of the shoe, are necessary to keep hyperextension of the fetlock ( and therefore Superficial DF tendon and suspensory ligament injuries) to a minimum. However, long, dished out toes, increase stress on the dorsal aspects of the carpal bones on break over. Horses who are “ back at the knee”, or have a history of carpal injuries, can benefit from a blunt, or set back toe, like the speed toe shoe. Trotting is the most complex discipline, as far as shoeing goes. Horses race on hard ground, so as to keep resistance to the sulky tires to a minimum. Shoeing is less necessary for traction purposes, as trotting tracks are not slippery, than for protection, shock absorbing and to influence gait. Trotting, a diagonal gait, at training or at racing speeds of 55km/hour, offers the possibility of every kind of interference, between any combination of limbs imaginable. Another, often encountered problem, is that under certain conditions ( fast accelerations e.g.) , a trotter might have a tendency to pace ( which is not allowed; there is harness racing for pacers, who are not allowed to trot, in the U.S. and Australia). Increase grip; fullered, creased shoes, widia cones, etc. Increase weight; Heavier shoes, toe weights, weighted bell boots. Needless to say, all three have their negative, collateral effects. Nails are short necked ( FJ0 slim e.g. ), as the shoes are often only 6 mm thick. Shoeing intervals are short, as leaver arms and encumbrance have to be kept to a minimum to prevent interferences; in fact it is not rare for a trainer, to test two or three different shoeings on the same horse in the same training session. Some of the best farriers in the world work, or have worked with trotters. This brief overview is necessarily limited in scope and leaves out quite a few of the, more or less organized activities, man has invented, for and with the horse. Besides a lack of space, this is due in no small part to the limited knowledge and experience of the author in many of the fields of horsemanship. Alternativer Hufschutz; Kirstin Becker; Cadmos Verlag GmbH,Lüneburg,2001. Farriery-Foal to Racehorse;Simon Curtis; Newmarket Farrier Consultancy,1999. Maximum Hoof Power; Cherry Hill and Richard Klimesh,CJF;Macmillan Publishing Company,NY,1994. Hoefverzorging en hoefbeslag; W.A. Hermans; Uitgeverij Terra Zutphen, 2 e herziende druk,1987. Précis de Maréchalerie; P. D’Autheville & P. Fromond ; Maloine s.a. editeur, Paris, Deuxième édition,1982. Charles Arthur McLellan ; The art of shoeing and balancing the trotter ; Lessiter Publications, Inc.,WI, 2001, Originally published by Trotter and Pacer, NY, c1927.